Assemblyman Francisco Moya addresses his supporters at his victory party at Tony's Pizza in Corona. He defeated Hiram Monserrate for the Council seat. 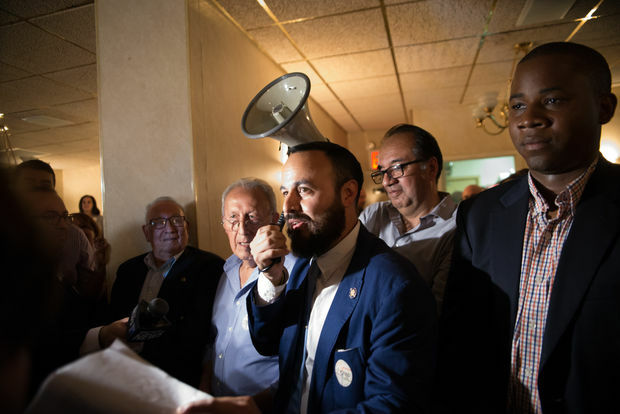 CORONA — Assemblyman Francisco Moya was elected to the City Council on Tuesday, defeating disgraced former state senator Hiram Monserrate in one of the most heated primary races in the city. Moya won with 55.6 percent, or 3,480, of the votes. More than 2,780 people, or 44 percent, voted for Monserrate — who saw the council race as a way to get back into public office after being booted from the state senate in 2012 for assaulting his girlfriend. He also served time in a federal prison for fraud. "We always said honesty and integrity was gonna win the day, and that's what we did tonight," Moya told DNAinfo New York before entering his victory party at Tony's Pizza on 104th Street in Corona. Inside, supporters — including Borough President Melinda Katz, Congressman Joe Crowley and nearly a dozen City Council members who campaigned for him — chanted "Moya, Moya" as he spoke into a bullhorn to thank them. "I want to thank the great people of the 21st Council District —t he people of LeFrak City, East Elmhurst, Jackson Heights and Corona," he said, noting that "honesty and integrity won tonight." He said he learned everything he knows from his parents, Ecuadorean immigrants who moved to Corona. "It was a nasty campaign but my parents raised me right." A jubilant Moya later thanked Julissa Ferreras-Copeland, who was not at the party but who he will replace in the council — and vowed to continue her work. "She really is a champion for all of us," he told the crowd. "We will continue on for her legacy." Over in East Elmhurst, the mood was much different at Monserrate's headquarters. As dozens of campaign workers lined up to get paid for working shifts handing out palm cards and leaflets, Monserrate fled — running across Astoria Boulevard with his pregnant wife, Michelle. They were paid later in the night, campaign officials said. He avoided questions from reporters as he got into a Lexus SUV and drove away. The chaotic scene continued long after Monserrate was gone, as people who stumped for the losing candidate waited for hours to get paid. And many claimed they got paid less than what they were owed. Anthony Pena, 27, was banking on the promised $240 he received for two days of work, from 6 a.m until 2 p.m. But when he received his check from the Hiram 2017 campaign it was only for $100. "If I knew this I never would have come," he said. "I would not have done it." Mike Nieves, a former aide to Monserrate who worked on his campaign, said everything was settled after midnight. "People are getting paid," he said. "If they work with me, I work with them." The City Council run was the second time Monserrate tried to get back into politics. He lost a bid to serve as district leader, an unpaid position, by 57 votes in 2016.